5 PM: Meet your fellow travelers, your teacher and your tour leader at our selected hotel for our orientation meeting followed by a welcome dinner. The Santa Barbara Mission is known as “Queen of the Missions” for its exceptional beauty.With its grand double bell towers, lush gardens and the majestic San Ynez mountains as a backdrop, the Mission is one of the city’s most picturesque landmarks. We will enjoy a picnic in the Rose Garden, a wonderland of more than 1,500 rose plants. Spring is the best time to see the roses in their full glory. An exceptional foreground for your sketches with the Mission in the back. With its Spanish-Colonial architectural style, dated from 1929, the court house will be the a perfect subject for your sketches: distinctive red tile roof, four-faced clock tower, verdant grounds and sunken gardens, elegant arches. Inside, you will admire the amazing architecture, including spiral staircases, thick wooden doors, hand painted murals and subtle touches that reveal the building’s historic Spanish roots. 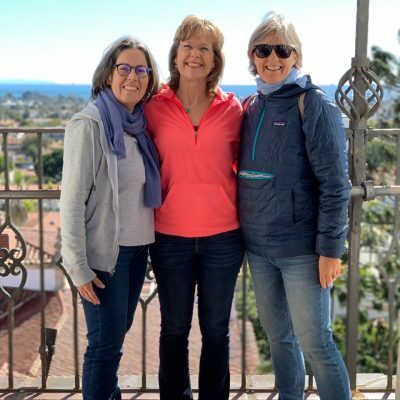 You can even climb to the top of the 18th century clock tower for breathtaking panoramic views of downtown Santa Barbara. Listed on the National Register of Historic Places, this adobe building from 1820’s was an affluent Spanish-Mexican-style home that became the social, political, and cultural center of Santa Barbara. From the oldest working wharf in California, you can sketch amazing views of the blue Pacific Ocean, breathtaking views of the harbor and beaches backed by the Santa Ynez Mountains, while enjoying salty breezes and soaking up the sunlight. The Santa Barbara meadow is surrounded by 1,000 types of native California plants and trees. In spring, the Meadow is famed for its spectacular show of wildflowers, with California poppy, meadow-foam, farewell-to-spring, succulent lupine and others vying for attention. The ebb and flow of ocean breezes makes the Santa Barbara Wine Country region a jewel in the crown of California viticulture. At the end of a sketching day, we will treat you for a wonderful wine tasting experience of some local wines. We will enjoy different wines accompanied by some finger food, in a private setting just for our group. It is time to finish up some of the paintings started this week. The sketching workshop will end with a little “Show and Tell”. We will then treat you for the farewell dinner before saying goodbye. You can leave at your convenience or extend your stay to enjoy this wonderful city. “Join me for 4 days of sketching with watercolor in beautiful Santa Barbara. We’ll enjoy the free-flowing and colorful nature of watercolor at its best while sketching and having fun! I’ll help you develop observation skills, color awareness, simple design principles and learn about light and shadows. We’ll investigate various techniques, sketching tools, and approaches to watercolor. Enjoy time with fellow artists, instruction and friendly critiques”. Space is very limited (max 12 participants). Brenda Swenson is the artist author of two books, Keeping a Watercolor Sketchbook (Award of Excellence Finalist) and Steps to Success in Watercolor. Her paintings and sketches have been featured in numerous books (Splash 11, 12 & 14, Artistic Touch 4, Creative Freedom, Incite 2), and magazines (Watercolor Artist, Watercolor Magazine, Watercolor Highlights, Plein Air Magazine). Brenda has achieved signature status in WW, NWWS, and SDWS. An active participant in the arts community she has served on the board of directors for the National Watercolor Society and Watercolor West. No one comes close when you compare what Jackie and Valerie offer their guests and instructors. I’ve got it good and I know it!!! I had the most amazing experience working with French Escapade. Never before have I experienced such a high level of attention to detail. Everything was handled beautifully and seamlessly from the moment I arrived: Locations, Accommodations, Transportation, Food….You name it and it was perfect. It’s rare to find someone like Jackie! She is outstanding at communicating and laying out the plan for the day making my job is easier. She is the best tour leader, host and guide. Thank you for the best experience I’ve ever had teaching in Europe. Best workshop ever! Join Lapin on this 5 day workshop in beautiful Santa Barbara. In addition to the demo and one to one help from Lapin, you will enjoy the camaraderie of your fellow travelers, while doing wine tasting or sharing a wonderful meal together. This is more than just a sketching workshop; this is a sketching holiday. Lapin is a French illustrator, artist, teacher, and urban sketcher living in Barcelona. You might spot him in a bright floral shirt and stylish hat as he travels all over the world and records every second of his life through sketching. From whimsical portraits of the people he meets to bustling urban sketches, Lapin’s style is unique and will inspire you to dive right into the scenery around you. Lapin already filled around 190 sketchbooks for the last 15 years and he particularly appreciates sketching on vintage accounting books which he finds in flea markets. He has given many workshops through the Urban Sketchers Program in Portland, Chicago, Barcelona, Mainz, Manchester, Singapore, Tuscany, Napoli, Lisboa… He’s teaching online on Sketchbook Skool and participate to the first Sketchkon in Pasadena. You can see more of his work on his website or on instagram. Price: $1,490 (Hotel is not incl., see below). Your hotel. We will be staying at the www.hotelsantabarbara.com. Make sure you tell them you are part of the group French Escapade when you call to make your reservation. Please do not book the hotel online but call them at 1-800-949-9869. Rates/night are $219 for a queen room, $239 for a king room and $259 for a double queen room (+ tax.) during the week (+$20/night for Friday and Saturday nights).